Tag Archives for " Juliette Schmerler "
For many people looking to get into the world of business ownership, purchasing a franchise is the ideal situation. You’re able to get behind an established brand, and you have access to proven marketing materials that will give you an advantage over starting a business from scratch. Of course, the lifeblood of any great franchise is the local audience that will act as its customers. Different areas may have different nuances, beliefs, and experiences that make an “across the board” marketing message ineffective. What works for customers in one part of a country or region may fall flat in another. Franchisors know that using a range of different marketing mediums is key. Radio and newspaper ads, bus bench ads, direct mail and vehicle wraps all have merit, but when it comes to really tapping into what your local audience wants, social media may be the best option. Any reputable franchise’s corporate office will have some sort of social media strategy in place, but franchisees must also get into the act and nurture their local fan base. Many older brands created their franchisee rulebook before the internet was such a force, but if franchisors want to keep up with the competition, a concise set of guidelines is crucial. Setting inexperienced franchisees loose on social media has the potential to be an unmitigated disaster, without the proper guidance. 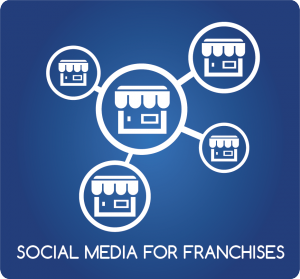 Generally, there are three franchise social media management styles, as noted in our Franchisor’s Guide to Social Media. They include a controlled style, where corporate controls all the posting, a limited style where franchisees can post but only with corporate approval, and an open style where franchisees can post as they see fit. Each style has its pros and cons, and different franchisors will have their own beliefs about which is best. However, it is always a good idea to let franchisees help create a unique voice for their own local audience since they are the ones immersed in the community. Tapping into that audience via social media requires some insider’s knowledge and specific steps to follow. Like any marketing endeavor, creating a sound local social media strategy begins with a great plan. Whether the franchise is a restaurant, a hardware store or a gas station, planning is key, and it begins with defining your target audience. If you don’t know who you are speaking to, the message will never be as clear as you’d like. Things like age, gender, marital status, occupation, income, and education all play a role. The planning process should also include a social media schedule. Often, what works best is a combination of franchise-wide promotions sent from head office and local news, events and promotions. In order to keep all of the information organized and stay on schedule, utilizing an effective social media management tool is key. When it comes to reaching your local audience, it’s important for a franchise to choose which platforms make the most sense. These days, you have Twitter, LinkedIn, Facebook, YouTube, and even Snap Chat and Pinterest have been used successfully to keep in touch. You must determine where your local audience likes to hang out online and then be there when they are. Naturally, if you are a franchisee for a teen beauty accessory store, your audience will be found in different places online than the local audience for an upscale steak house franchise. You must figure out where they congregate and how they prefer to be engaged, in order to be successful. Quite often, the “how” is almost as important as the “where” in terms of engaging with your local audience. In some cases, standard tweets might do the trick, while others may prefer videos, memes, infographics or Facebook posts. It’s also important to create local profiles for each social media platform, so each audience feels as though you are speaking directly to them, and the messages are always relevant. Franchisors should make sure this is happening, but if it isn’t every franchisee should speak up. Once the level of corporate office / franchisee social media participation has been established, you have an overall plan in place, you know which platforms make the most sense and what kind of messages produce results, it’s all about consistency. This concept seems simple, but it’s not unusual for franchisees to have no online experience, or to get caught up running the franchise and forget about their social media responsibilities. It is important for franchisees to take their local social media duties seriously, and delegate or outsource if necessary. For franchisors, supporting franchisees with a plan designed to help them reach their local audiences via social media will benefit everyone involved. To learn more about dominating the world social media for your franchise, check out our Franchisor’s Guide to Social Media. Juliette Schmerler is the founder and creative director of Sparktank Franchise Marketing, a boutique marketing agency that focuses on helping franchisors build their brand, find new franchisees and grow sales with local marketing. Juliette keeps her finger on the pulse of the latest reds of projects marketing and online trends through ongoing training as a certified Duct Tape Marketing Consultant.